Set yourself up for success with our Starter Kits! These introductory kits have been designed to include cutting-edge business-building materials and product samples. These kits are the perfect way to get started and introduce our Young Living opportunity and lifestyle. Young Living’s Premium Starter Kit is my favorite way to begin using essential oils. This is a variety of our favorite oils and great start to your new essential oil journey. This is a very cost efficient way maintain your healthy lifestyle. There are so many ways you can utilize these oils as a natural alternative. Are you ready? 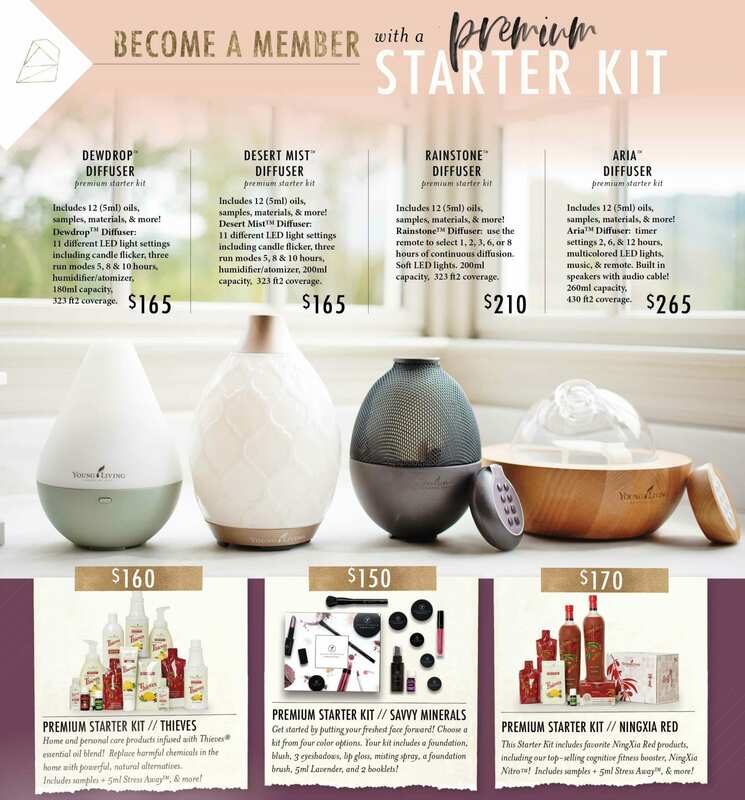 Enroll with the ultimate Young Living product and business experience, the Premium Starter Kit with Rainstone Diffuser! An extraordinary value that offers a comprehensive introduction to the power of essential oils, the Premium Starter Kit is the perfect option for those who are serious about transforming their lives. The Basic Starter Kit offers all the product samples and literature you need to begin experiencing the wellness, purpose, and abundance Young Living has to offer. You also obtain the ability to purchase any Young Living Products at 24% off of the retail prices. At a cost of only $45 (USD) the saving will quickly add up. Enroll with the Ultimate Young Living Premium Starter Kit with Aria. This is an awesome product and business experience! An extraordinary value that offers a comprehensive introduction to the power of essential oils, the Premium Starter Kit is the perfect option for those who are serious about transforming their lives. Enroll with the Premium Starter with Dewdrop Young Living kit and business experience! An extraordinary value that offers a comprehensive introduction to the power of essential oils, the Premium Starter Kit is the perfect option for those who are serious about transforming their lives. Power your life with the Premium Starter Kit with NingXia! Delicious blend of nutrient-rich wolfberry puree, superfruit juices, and pure essential oils. Formulated to support wellness for every lifestyle, NingXia Red® is a unique, powerful drink that will help you make the most of every day. This Starter Kit includes favorite NingXia Red products, including our top-selling cognitive fitness booster, NingXia Nitro™! Young Living is proud to offer a complete line of home and personal care products infused with the pleasant, spicy aroma with our Premium Starter Kit with Thieves This Starter Kit! This kit is ideal for those wishing to replace harmful chemicals in the home with powerful, natural alternatives.